We very purposefully stumbled upon the Wolf Creek Trout Lily Preserve near Cairo GA this past weekend. Cairo (pronounced like the famous syrup) is not a place that you can easily stumble upon… it’s really in the middle of nowhere. There’s no hint from the roadside to the casual passer-by of the miracle contained beneath its trees. Probably, I expected that the people who wrote the brochure were exaggerating. 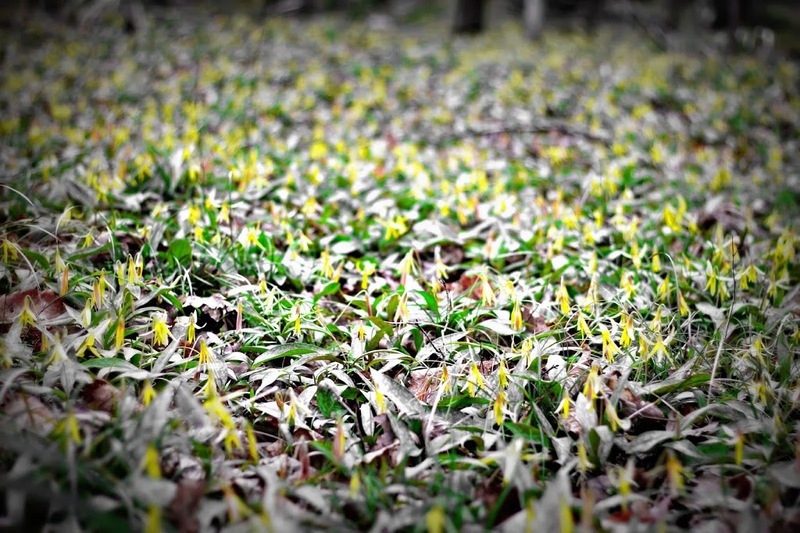 Nope… millions of Trout Lilies bloom in this very special place beside a stretch of highway that looks like every other stretch of highway in GA.
Trout lilies as ground cover, can you imagine? 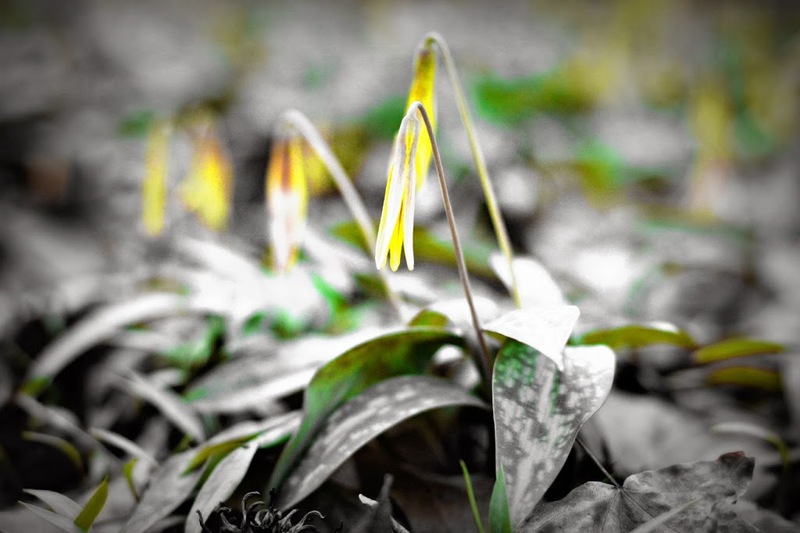 Trout Lilies are a common harbinger of Spring in the Northeast; I don’t believe they’re very common in this part of the country and certainly not in this number. It’s said that this is the largest concentration anywhere. The day we visited was overcast and it was almost dark by the time we found the spot… that’s evidenced by the nearly closed flowers. We also found many, many Spotted Trillium and a couple (impossible to photograph) Twayblade Orchids. I’d think with more time there, I might’ve found all sorts of interesting things. If you want to go out looking for Trout Lilies in your part of the world, pick a sunny afternoon (when the flowers will be fully open!) and look for them blooming on wet hillsides near streams. They’re a spring ephemeral, so do all their work of blooming and setting seed before the forest canopy puts them into shade for the season. 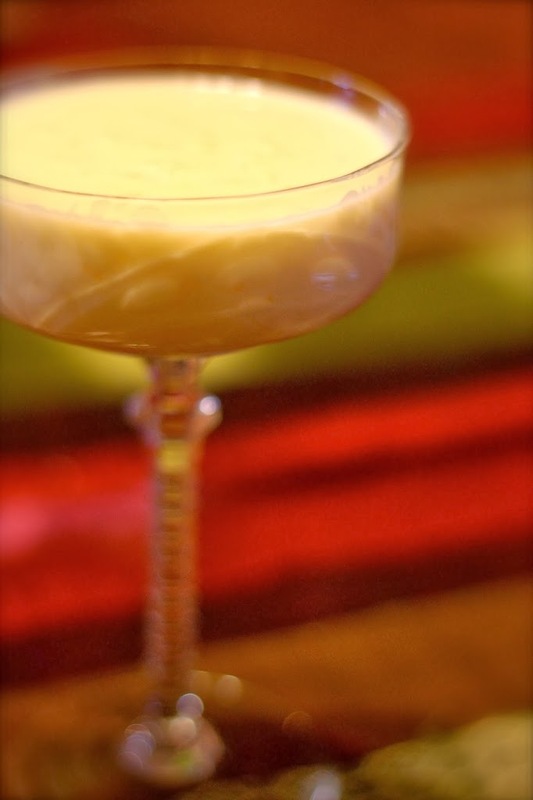 Go early while it’s still freezing cold out. It makes finding them sweeter, trust me. Happy hunting and let me know what you find! I would love to be able to share the recipe for this most wonderful rice pudding, but I’ve been forbidden to do so. According to my sister-in-law, it’s a “family” recipe and not meant to be shared with the world. She insists that only her dad could make it really right and that the recipe would self destruct if made to perfection by anyone but him. His recipe is unique in the quantity of rice used, I think, and leads to a thick milk custard with an understated presence of rice. Because I can’t leave well-enough-alone, the second time I made it, I dressed up the rice/milk mixture with a bay leaf, as well as the expected vanilla. It adds a little something nice.